The Human Touch Bali is a massage chair that we rate highly in aesthetic design, features, and durability. 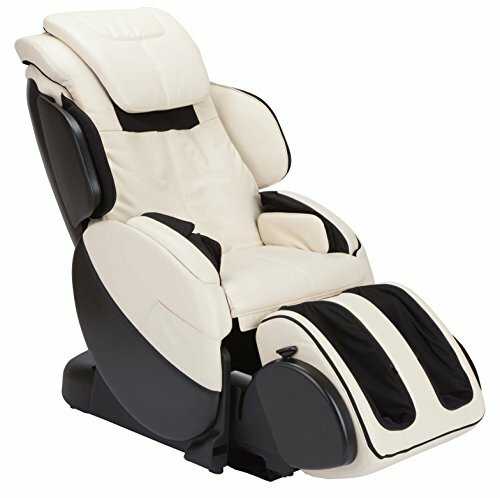 It is lighter and more portable than traditional massage chairs while retaining premium-chair features like zero gravity, 3D massage technology, and body scan. 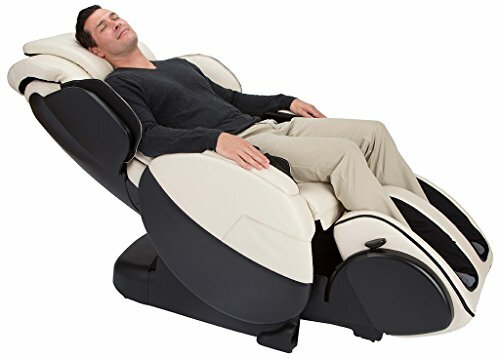 It’s also got patented Human Touch features that make it unique, such as foot paddle massage, targeted techniques, and an adjustable ottoman. Your guests will be greatly surprised to find ‘that pretty little recliner’ is actually a robust massage chair replete with a multitude of relaxing and pain-relieving features. Full-Body Stretch: Stretches the spine to increase blood flow to the vertebrae and discs, effectively rejuvenating the lower back. Human Touch has been helping people for more than 35 years, and is a premier supplier of massage chairs all over the United States. They provide high-quality massage products with patented massage systems that replicate real massage techniques. The features that come with Human Touch products are perfect for today’s modern living spaces. You can find the printable Use and Care Manual here. Human Touch products, including the HT-Bali, have 5-year warranties. The HT-Bali Acupoint detection measures the whole length of the back, along with your neck and shoulder contours. It then maps the main pressure points that need to be targeted for your personalized massage. You can adjust the intensity for foot and calf massage. This is a feature that helps people with different body types achieve total comfort. The covers of the HT-Bali are removable and machine-washable, which makes cleaning and maintenance much easier. This mode helps you feel like you’re floating on air—you get placed strategically on active contours placed at the hips, shoulders, arms, and seat. This allows your body to get lifted, manipulated, squeezed and massaged, providing ultimate comfort. The HT-Bali massage chair comes with an LCD remote control that offers a complete suite of features and programs. The remote comes with a crisp LCD screen. The HT-Bali features a retractable arm massage well that allows your arms to get massaged, too. The HT-Bali lets users choose from a variety of 9 vertical heights. This helps anyone achieve their desired full-length back massage. I’m going to start off our pros list by mentioning that this chair comes with full body stretch and zero gravity features. Looking at the reviews on our favorite online store, I was appalled that one (unverified purchase) customer gave the HT Bali a low 2-star rating for purportedly not having these features. Either said reviewer was smoking wild mushrooms, is a troll, or perhaps an agent from a competitor brand. Whichever the case, let me assure you that this chair has both features, and more. If there is anything that Human Touch excels at it’s designing their massage chairs to look more like comfortable recliners rather than bulky and clunky massage chairs. Cast your mind back to some of the older Human Touch massage chairs like the Novo or the iJoy Active and you’ll realize that all models are sized smaller than their counterparts, do not follow the usual massage chair physical structure, and have features that are purposefully hidden for a better aesthetic. The HT Bali won an ADEX award for Design Excellence. What ottoman? That was my first question when I first laid eyes on the Bali. Remember, I said that the chair looks like a recliner. The ottoman is very cleverly hidden and designed in the HT Bali. Once you figure out how to get it to slide out from the body of the chair, you will see the usual piece where you can lay your feet. This piece is adjustable so you can adjust the length if you have short or longer legs, and you can flip it over just like the Panasonic MA70 and Panasonic MA73. By flipping it over, you are hiding the slots for the feet and instead, you can rest your feet on the cushions just like you would with a recliner chair. This is very handy if you’re just sitting on the chair and watching television. Mechanical foot rollers are a staple with newer massage chairs, but what’s unique about this chair’s foot rollers is the paddle technology. Instead of airbags, you get a massage from molded pieces within the chair that produce wave-like motions. Now, some people have thick legs while have some scrawny legs (like me). This is all fine and good because the width for the feet slots can also be adjusted. And while the sides of your feet are getting that wave-like massage from the paddle technology, the soles of your feet are getting a delicious massage too with regular foot rollers. Overall, you’re guaranteed a good and effective massage in your lower extremities. One other cool and unique feature about this chair is that the intensity of one particular part can be adjusted separately from the rest. This is unlike the intensity adjustments of other chairs where the entire chair adjusts as one whole piece. With the HT Bali, because the intensity is adjustable in separate sections, you can opt to say, have a high intensity for your lower back, and a lower intensity for your feet. In my case, I often suffer from lower back pain but can’t stand too much pummeling force on my feet due to a history of plantar fasciitis. You can adjust the chair according to your individual needs and preferences. 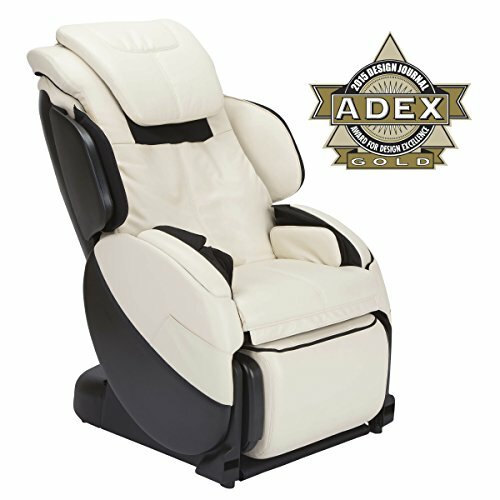 This massage chair has special techniques and adjustments that make it well suited for a user who suffers from back or shoulder pain. For one, the shoulder airbags pin down your shoulders so that the back rollers can come in and give you a more intense massage. Instead of the usual “shiatsu” or “Swedish massage” techniques, Human Touch has come up with targeted techniques. There are 21 in all but some of my favorites include the Center Back Stretch, Deep Shoulder Flex, Shoulder Stretch, Waist Stretch, and Gentle 3D Flex and Stretch. Just from the names, you can already imagine what they do in action. Stretch Down, for example, gives you a downward kneading massage that will stretch the muscles along your spine. This Human Touch model is lighter and thinner than most massage chairs. If know your way around massage chairs, you can easily set this up alone. It comes with wheels so you and maybe a friend can put it in position without having to use a White Glove delivery service. If you aren’t handy with putting things together and/or have a bad back, I’d recommend going for White Glove. Because I used to suffer from chronic pain, heat therapy is something I really like to find in a chair. Not to mention, it’s a great feature during the cold winter weather. Sadly, this model doesn’t have it. The HT Bali has a short 26″ S-track roller. If your priority is getting a massage for the lower portions of your body including your thighs and glutes, you’d be better off with a long L-track like the 52″ Hyper SL-track on the Kahuna Hubot HM-078 or the 58″ track on the Luraco iRobotics Legend. If you are a big guy or have lanky arms, you will find the armrests too short. 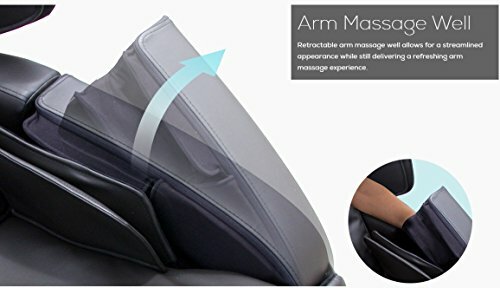 You get an arm massage from this chair but not much coverage compared to other brands and models. Still, just having arm massage on the Bali is a big step because Human Touch chairs normally don’t have this feature. There are many newer chairs out in the market already, but Human Touch is a brand that we will always recommend for their aesthetic designs, solid features, and excellent craftsmanship. 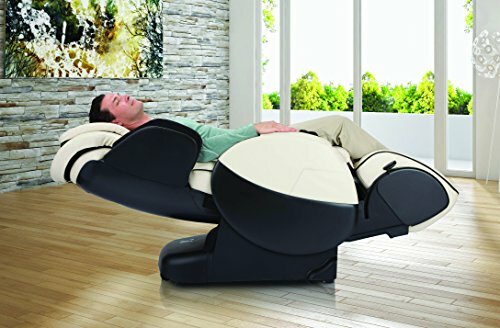 Happily, the HT Bali doesn’t disappoint and we highly recommend it if you want a mid-priced massage chair with zero gravity, 3D massage, patented techniques, and overall great features.